It’s sitting there, meditating or maybe brooding like some sort of sentinent being. But something is definitely going on inside. Something wonderful, or so I’m told. 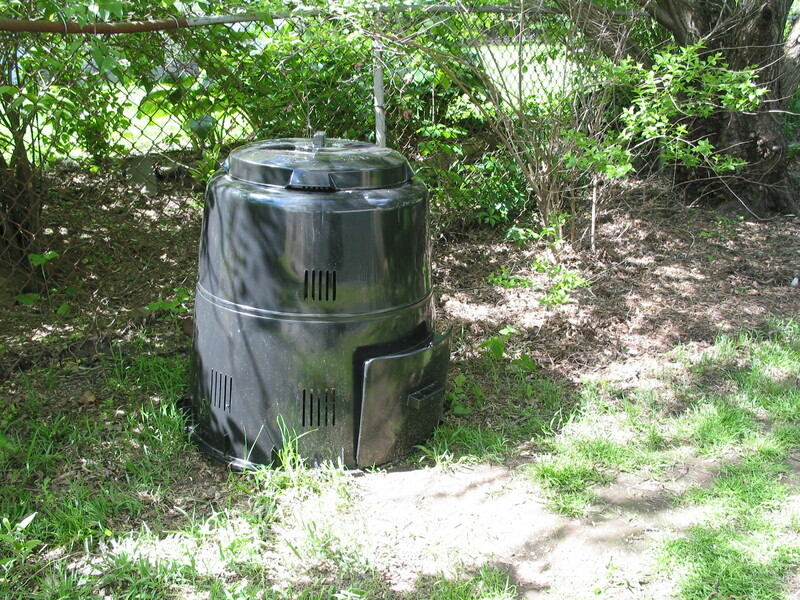 We, and many of our fellow residents ponied up and purchased composters two weeks ago in a town-wide promotion. I’m supposed to feel better about myself for saving the earth somehow but it’s not reducing our amount of waste very much. If it helps the garden though, I’m all for it. The booklet that came with it says to load it up with primarily kitchen waste. I’m thinking fruit flies (and starting to see them already when I open up). Frequent turning is supposed to alleviate this and prevent foul odors. They also said not to put it very far from the house so it won’t seem like a chore to make the trip out. I sincerely hope they’re right on all counts. Thanks for your comment on my blog. I hope that your composting adventure turns out well, too! I think it is Jabba the Hut.